August is always an interesting month. While it is considered by many to be summer’s last stand, I have found it to be more of a transition period into Fall. There’s a lot of planning for what’s to come, but not really a whole lot happening in the now. At least that’s been my August. Of course, on August 9th, JJ Grey & Mofro, with support from Springfield’s own Speakeasy, quite literally had everyone in the Gillioz Theatre jumping out of their seats and dancing with joy. No doubt the most jovial and, well, rowdy show I’ve seen at the historic venue. 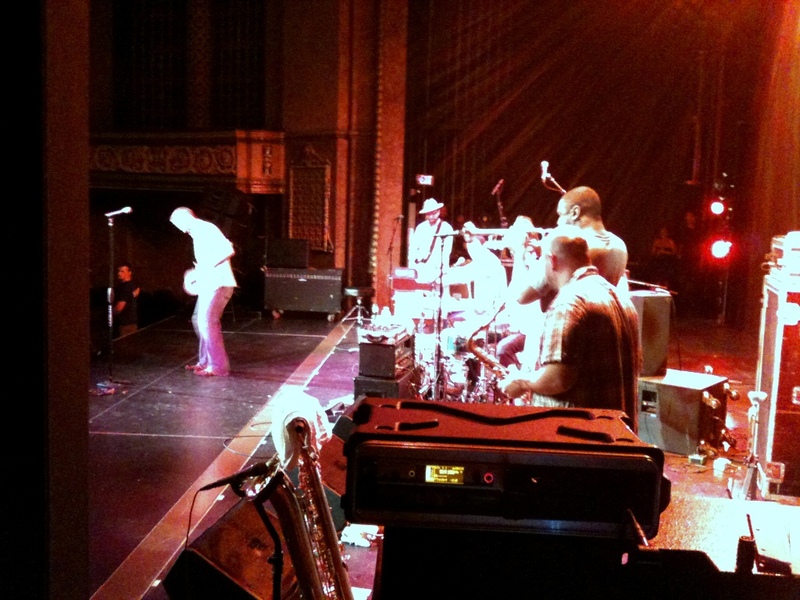 JJ Grey & Mofro tearing up the stage. In the few minutes of down time before the show started, I set up a couple of Shure KSM27 large-diaphragm cardioid condensers just in front of FOH up on the theatre’s balcony. They were placed as a spaced pair, approximately 20 feet apart. That spot in the theatre is a bit boomy, but was the unobtrusive to our patrons, and made getting signal to the console easy. I used the preamps in the Gillioz’s Midas Verona 400 then ran direct out to the line ins on my Mackie Onyx 1640 (currently my only means of analog to digital conversion) and recorded via FireWire into Logic on my MacBook Pro. Despite the less than perfect setup, I was able to get a pretty good recording of both bands’ sets. With any luck they’ll let me share them with you in the near future–fingers crossed. Since that show the theatre has been dark, but the office has been a whirlwind of booking and advancing Fall shows. Tomorrow is a talk from PostSecret creator Frank Warren, the Banff Mountain Film Festival on Sept. 15, Tommy Emmanuel on Oct. 5, Oct. 9 is the sold-out Bryan Adams show and those are just the ones I can discuss…there’s much more in the works. Stay tuned to the Gillioz website for show announcements and tickets or follow the @GilliozTheatre on Twitter for up-to-the-minute news. Other than my work at the Gillioz, I’ve been doing some freelance “tech director” work for upcoming concerts taking place on Drury University’s campus this fall. On Oct. 1, Colbie Calliat is taking the stage at the O’Reilly Family Event Center with support from Andrew Grammer. I find it excitingto be working a show in a different venue from the usual. There’s no learning like doing. And of course, there’s the job that’s treated me so well for so many years: disc jockeying. This past weekend I had the pleasure of working a wedding in Columbia, MO. Several friends have moved up there in the past year, so not only did I get to help make someone’s wedding one for the record books, but managed to hang out with some damn good people during my visit. 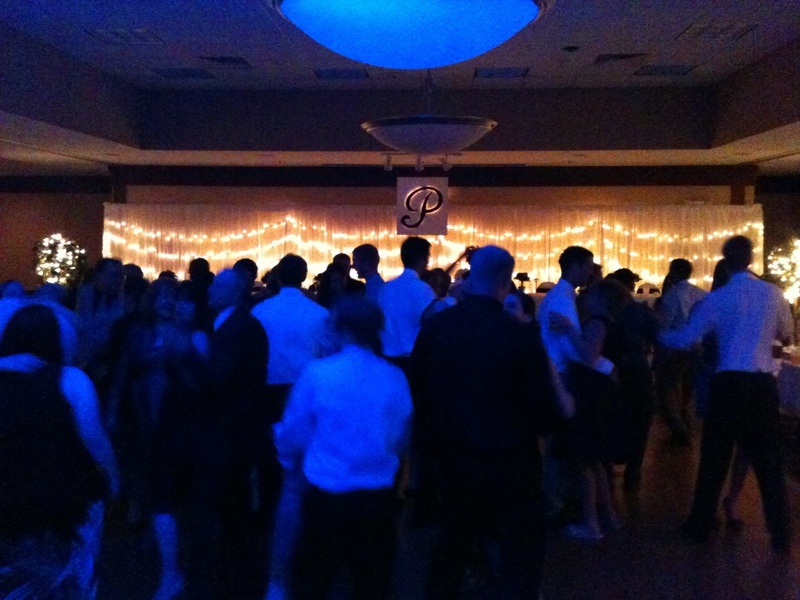 I’ll leave you with this shot of a packed floor for the last dance at John and Courtney’s reception.